Are you using MailChimp? are you building email list using Lead capture forms? 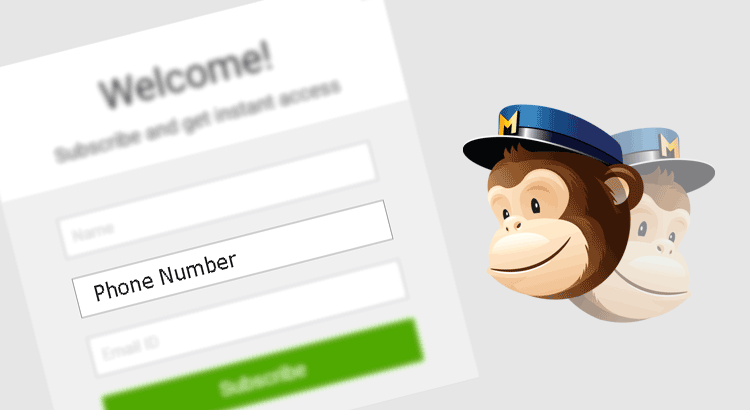 chances are that you can not capture leads with Phone Numbers, that is because the default MailChimp list doesnt come with Phone number, all you can do is add name and email ID of the subscriber, nothing else. Some time you need your subscribers Phone number for various reasons and if you setup Phone number field in your forms and start capturing leads, those leads come with no phone number in MailChimp list. But MailChimp allow custom fields for the list, so if you can have any new/custom field to match your purpose and send data form different places like Lead Capture forms or API and add that data into that custom field, similar way we can add a new merge field for Phone Number and your leads will come with Phone Numbers now. How to Create Merge Field for Phone Number? In the field options change the Merge Tag to PHONE in all caps, and save that field. Once you are done you are all good to receive leads with Phone numbers, try this with your MailChimp lists and if you find any difficulty feel free to write to Optingun Help.